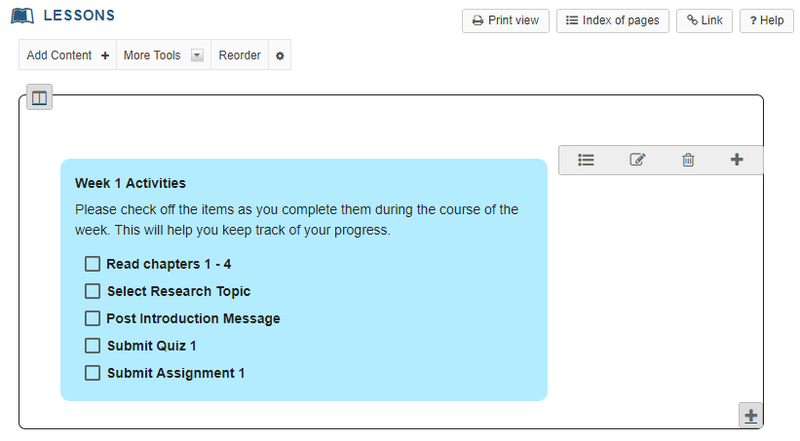 Sakai Community DocumentationSakai 19 User Guide (English) LessonsHow do I add a checklist on a Lessons page? 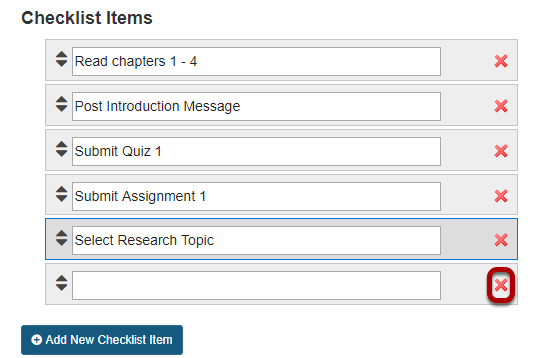 Instructors can add Checklist items to a Lessons page. Checklists allow site participants to manually check off items as they complete them. Click Add Content, then Add Checklist. Zoom: Click Add Content, then Add Checklist. 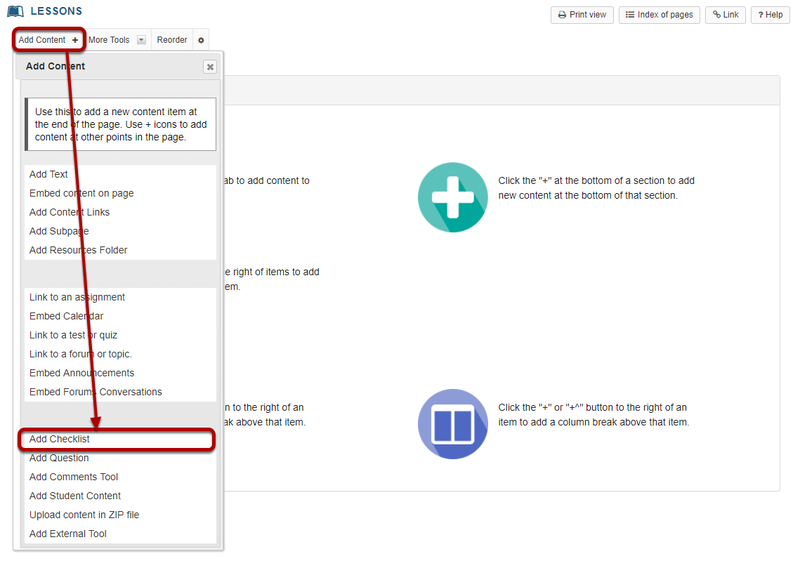 From the Add Content drop-down menu, select Add Checklist. 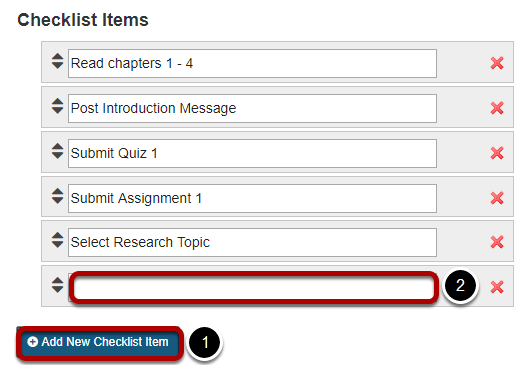 If you don't want students to see the name of the checklist, you may check the box to hide the name. Students will still see the description and checklist items, but not the title. The description typically explains the purpose of the checklist. Click the Add New Checklist Item button to add a new item. 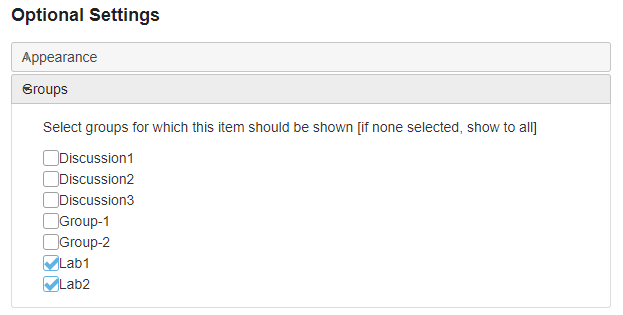 Enter the item title in the empty text field, and then repeat the process to add additional items. If you need to remove an item from the list, click on the red X to the right of the item. If you need to reorder items, click on the arrows to the left of the item, and then drag it into the desired order in the list. If you would like to indent the checklist on the page, or designate custom CSS for the checklist, click on Appearance to expand those settings. 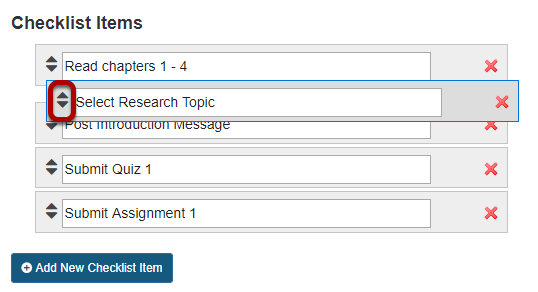 If you would like to make the checklist visible to specific groups only, click on Groups to expand those settings and select your desired groups. The checklist will display on the page. Prev: How do I embed forums conversations on a Lessons page? Next: How do I upload content in a zip file on a Lessons page?